Tomorrow will mark our first full week aboard the CCGS Henry Larsen. In one week, I have learned a lot of things, ranging from what cod tongues taste like to the details of sea ice crystal formation to the usefulness of a balaclava in the Arctic. It’s been an incredible week. Being on the Larsen is almost like being on a mobile town from Newfoundland. Most of the crew speak in heavy accents that sound more Irish than what I would normally consider Canadian, and cod tongues, scrunchions, and Screech are normal fare. I tasted cod tongues today, and I made my entire table laugh with the face I made. They aren’t bad, but I’m not fond of seafood that tastes particularly fishy, and I should’ve gotten tartar sauce with them. Scrunchions I didn’t try (Dave, one of the Canadian scientists, describes them as “essence of pork”), but Screech is something I actually like. Andreas and Pat had instilled in me a fear of Screech before we came to the ship. The vague stories of screeching ceremonies (in which you become an honorary Newfoundlander) painted a false picture of a terrifying rum known as Screech. In reality, it’s quite tasty rum, and it’s now my go-to drink at the bar. The last few days have been full to the brim with the retrieval of moorings from 2009 and CTD and rosette survey lines. 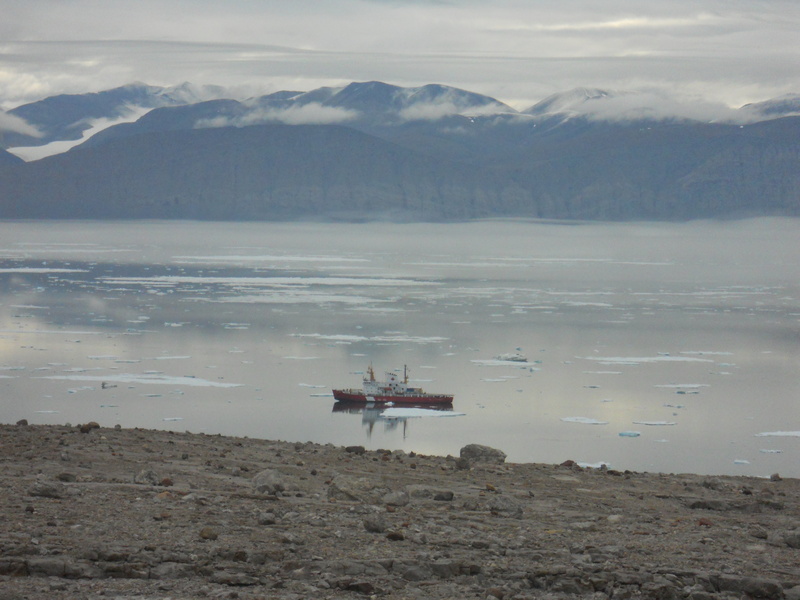 We successfully retrieved 6 of 7 sets of instruments that were deployed here in 2009, but so far at least two of the instruments were severely damaged. A few of them seem to have hitched a ride with the Petermann ice island in 2010, and they are definitely worse for it. Today we finished the second of our survey lines. We alternate between lowering the conductivity, temperature, and depth sensor (CTD) and the rosette, which collects bottles of water at different depths. We then do what Humfrey Melling calls “piddling the bottles,” or collecting samples from the collected water. We’re taking samples to process for data regarding barium, oxygen-18, salinity, and nutrients like phosphate or sulfate. In the week we’ve been on the Larsen, I’ve learned a lot and even gained a few pounds from the huge servings of food we’re given at every meal. It’s amazing how quickly I’ve settled in. I feel like I’ve been here much longer than a week, but I’m glad I haven’t because it means I get another week and a half on this ship in the beautiful wilderness of the Arctic. I know next to nothing about helicopters. They’ve always seemed exciting, but I couldn’t tell you anything about make or model or what makes one helicopter better than the next. As it turns out, helicopters are just as exciting as they seem on television. Sunday morning, as our group of eight scientists met to discuss the plan for the day, Brian, the Chief Officer, interrupted to ask if anyone wanted to tag along on the first helicopter ride of the trip. Renske’s hand immediately shot up into the air, and I volunteered a little more slowly. We quickly wrapped up our meeting, and Renske and I layered on jackets and headed up to the flight deck. The purpose of the flight was to give the Ice Services Specialist, Erin, a chance to look ahead at the ice cover up to Hans Island, where we were headed. She was going to make a chart of the ice to help guide the ship through the path of least resistance, and maybe do a little sightseeing. 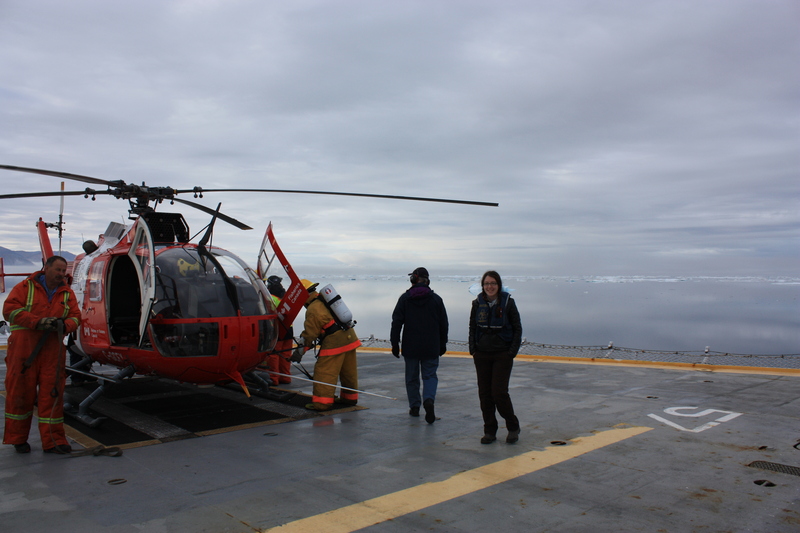 An air of excitement filled the helicopter because neither she nor the pilot, Don, had ever been up here in Nares Strait either. Once the first bit of work was done, we flew over to Ellesmere Island to see the amazing folded ranges. The colors there are amazing – bright reds and yellows in layers, crunched up in beautiful synclines and anticlines. The hills are scored with avalanche chutes and based with alluvial fans. There are glaciers nested in the folds of the mountains, and it is simply breathtaking. 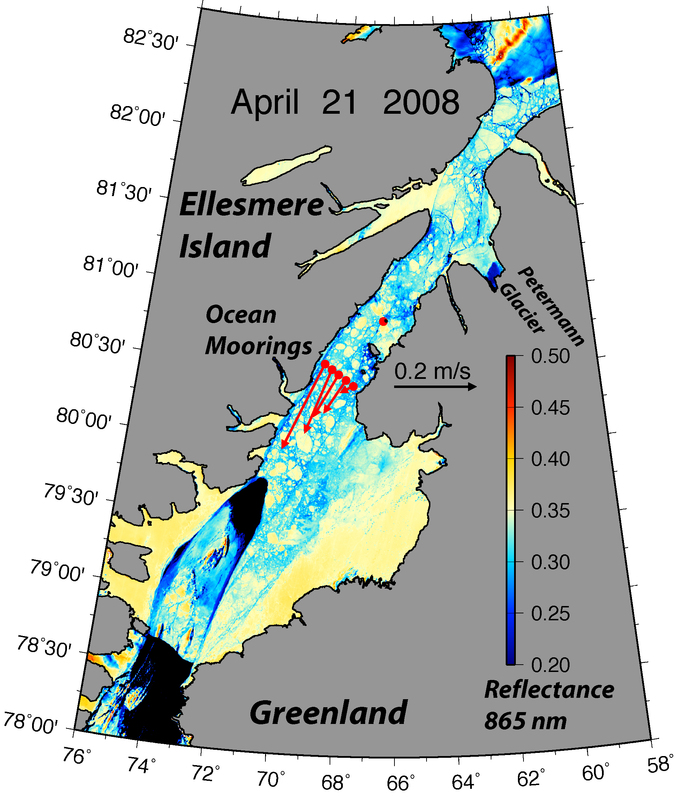 There is a stark contrast between Greenland and Ellesmere Island on either side of the Kennedy Channel. I was awestruck by Greenland while we were in Thule, but Ellesmere Island makes the Greenland side of the strait look dull and gray in comparison. It’s one of the first things you notice up here, and many members of the crew point it out on sunny days. The contrast brings up all sorts of questions about the rocks even for the casual observer. A few theories have come up over the years as to what made the sides of the channel so different. Some think that the channel lies along some sort of fault or plate boundary, and some argue that plate tectonics has nothing to do with it. 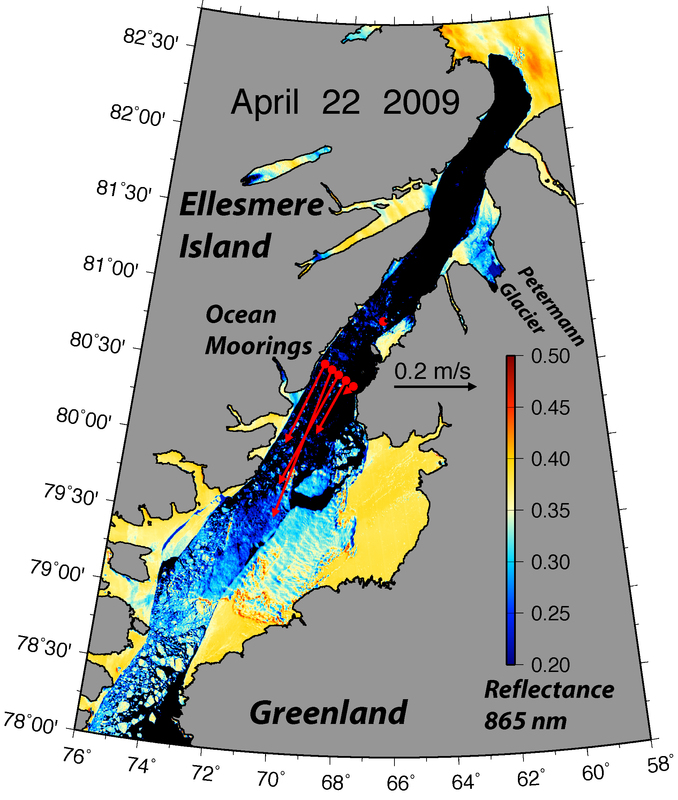 No matter how I look at it, something has to have been vastly different on each side of the strait because the Greenland side has all of these horizontal layers in a much grayer rock, and the Ellesmere side is more than just colorful layers – they bend and contort in violent and beautiful ways that seem much more active than the Greenland layers. Both sides of the Nares Strait are beautiful in their own ways, and the view from a helicopter was spectacular. We were able to land on Hans Island, which is a great example of the carbonate rock of Greenland, and is apparently rife with marine fossils. We also flew over Franklin Island and farther south to Rawlings Bay and Jolliffe Glacier. It was the first time I had seen a large glacier close up, and it was amazing to see the ridges in the ice, and I was surprised by how much a glacier seems to look and act like a very slow moving river. As we flew into the fjord, I was continually amazed by how nearly vertical some of the layers of the rock were, and by the bright reds and yellows of the rock. Flying back to the ship we flew over the mountains and I was amazed by the way the rock beneath us dropped away completely as we flew into Nares Strait. The geology, the ice, and the experience of being in a helicopter were all so incredible. An epic journey often ends at home. Odysseus was sailing home towards his wife and family, Jason and the Argonauts return home to Thessaly with the Golden Fleece, King Arthur’s Knights return to Camelot after they fail or succeed at their Grail Quest, and, in more modern literature, Frodo returns to the Shire. The hero of an epic fights to preserve his home, and is drawn back there after many adventures. Similarly, sailors paint their bodies with reminders of home: names of loved ones, swallows who travel far but always return to the nest, and navigational stars pointing them home. 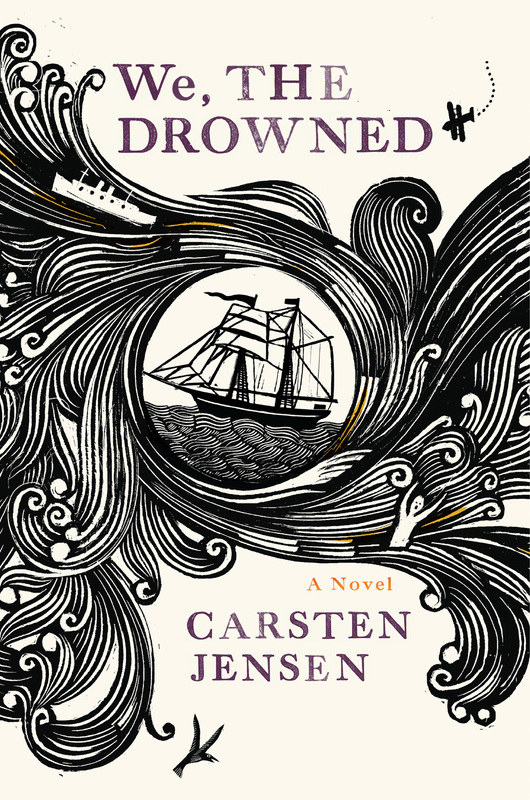 Appropriately, Carsten Jensen’s novel We, the Drowned centers its epic tales of traveling the seven seas on the place all of the characters at one point call home: the port town of Marstal, Denmark. Spinning tales of adventure spanning more than a century, Jensen draws from the rich history of Marstal, where he grew up, as well as generations of nautical literature. Told in a series of shorter stories, reading We, the Drowned is more like listening to the bedtime stories of childhood and the legends you hear around the campfire than reading a 700-page tome. The story loosely follows three generations of Marstallers as they are drawn to the magic and adventure of the sea, living their lives at the beck and call of King Neptune. The tale begins with Laurids Madsen, the sailor who “went up to Heaven and came down again, thanks to his boots,” and who eventually disappears into an Australian port. The story of his son and their generation growing up is fraught with the misery of a sadistic teacher and lost fathers, but Albert, Laurids son, becomes determined to find him. Albert becomes a central focus of the book, representing Marstal’s past, present and future. The stories range from shrunken heads and selfish traders to brutal wars and sweet romances. These adventures occur wherever the winds blow the sailors of Marstal, including the coasts of Pacific Islands, the Americas, the depths of Africa, and the frigid waters of the Arctic. We, the Drowned is a fascinating nautical epic, exploring all of the fantastic, wonderful, terrible and awesome faces of the ocean and the people who travel King Neptune’s realm.